The Central Housing and Planning Authority (CH&PA) is set to challenge moves to sell what was to be a posh housing estate on the East Bank of Demerara which had been connected to the controversial Chinese logging company, Baishanlin but the appointed receiver says the authority has no locus standi. Yesterday, a full-page advertisement appeared in all of the daily newspapers announcing that the 100 acres of land located at Providence was up for sale and that accountant Nigel Hinds had been appointed Receiver-Manager of Sunset Lakes Inc, owner of the land. 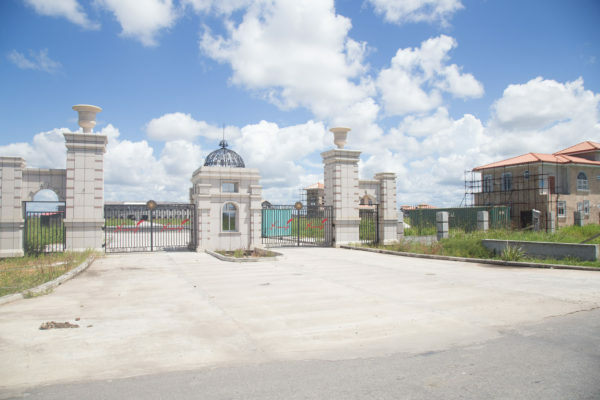 Sources have indicated to Stabroek News that the CH&PA’s lawyer is “crafting a response” to the advertisement and that the authority will challenge any move to dispose of the land. It was pointed out that CH&PA, which sold the land to businessman Brian Tiwarie under the previous administration for him to develop it into a housing scheme, has already signalled its intention to repossess the land since the agreement entered into was not kept. However, Hinds speaking to Stabroek News stated that CH&PA has no business in the matter since Tiwarie sold the land and the new owners have legal title for the land and were not in any agreement with the authority. According to Hinds, he was appointed receiver by a local bank which gave a loan to the principal owners of the 100 acres and are now seeking to recoup their money. The loan was granted over the last two to three years. “I was appointed receiver by the bank…they went to the bank and secured a loan and now the bank is looking to recoup their money,” Hinds told this newspaper when contacted. He believes that the CH&PA has no say as from the documents he has seen the land is legally titled to the principal shareholders of Sunset Lakes. He said that the land was indeed purchased by Hongbo Chu, one of the owners of Baishanlin, but in that same agreement of sale it was then transferred to Sunset Lake. From all indications Tiwarie is the owner or part owner of Sunset Lakes Inc. Referring to comments made by Chief Executive Officer of CH&PA, Lelon Saul that the land will be repossessed since the terms of the agreement as it pertained to the development of the land were not met, Hinds pointed out that the present owners of the land had entered into no agreement with the authority. “What is their locus standi?” questioned Hinds, adding that Sunset Lakes has a clean transport and that the CH&PA was dealing with Tiwarie. In yesterday’s advertisement Hinds invited tenders from local and foreign parties interested in purchasing 100 acres of land en bloc or less in the Providence area. The land is located within one mile and south west of the Guyana National Stadium. Under the previous PPP/C administration, businessman Tiwarie had signed an agreement via his Sunset Lakes Inc company with the CH&PA to purchase and develop the 100 acres of land at a cost pegged at $475 million. He paid a quarter of the sum and had six months to pay off the balance. In 2014, Tiwarie went into partnership with Hongbo Chu where the latter would pay him US$8 million and develop the site. As part of the agreement, he would also get to keep some of the house lots in the gated community for his personal use. However, Tiwarie took Hongbo Chu to court in 2016 for the balance of US$4 million on the agreed purchase price. It is unclear if this matter has been settled. The CHPA has signaled that it is moving to repossess lands where the developers failed to live up to their commitments. Joe Harmon to China in 2016. Questions about that trip remain unanswered but it had been suggested in some quarters that Baishanlin and Tiwarie were looking to hammer out a deal on outstanding debt and other matters pertaining to Sunset Lakes.